May 3, 2018, 10:42 a.m. The government will spend GH¢453 million ($103m) of the country’s oil revenue to fund the free senior high school programme this year. The amount is more than twice the figure it spent on the programme, one of its major flagships, last year, having doled out GH¢198 million ($45m) in 2017. The Minister of Energy, Mr Boakye Agyarko, disclosed this in Houston, Texas last Tuesday at a special roundtable meeting with some oil giants on the sidelines of the ongoing Offshore Technology Conference (OTC) as he made a strong case for players in the industry to take full advantage of opportunities in the country and invest in that sector. 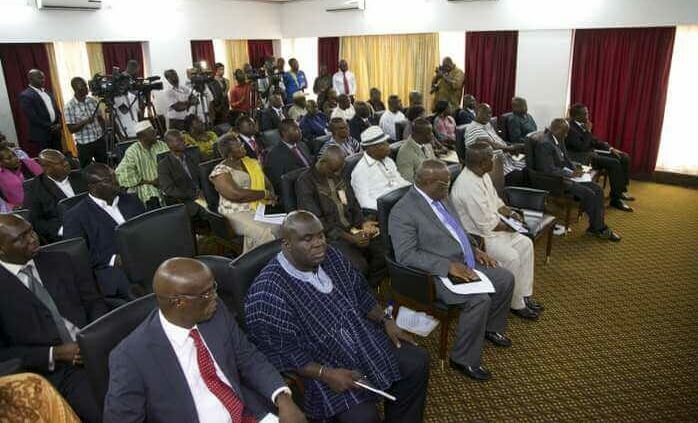 The meeting, which was arranged by the Commercial Service of the United States of America Department of Commerce, featured major oil companies such as BP, Exxon, Kosmos and other players in the oil and gas industry interested in knowing more about Ghana’s oil prospects. “It is the intention of the government to ensure that the revenues generated from the oil find in Ghana is used, among other things, for the socio-economic development of the country, while improving its manpower base,” he said. Mr Agyarko noted that although the country generated revenue from up to 200,000 barrels of oil in the country per day, it was still committed to ensuring that the funds accrued were put to good use for the benefit of the citizenry of the country. Briefing the investors, he indicated that there were still enormous opportunities within the sector for oil and gas investors across the world to pump money into the development of more blocks in the country. He mentioned, for instance, that five of the country’s oil blocks were ready to be given to investors to prospect by the close of the third quarter of the year. “Three of the blocks will be open to competitive bidding while two will be for restricted tendering,” he said. The Energy Minister stated further that four additional blocks would be reserved for the Ghana National Petroleum Corporation (GNPC) to also prospect as part of efforts to develop its capacity in that area. In the area of gas production, he said, the government intended to make the large volumes of that resource and its derivatives to be the main feature of the economy. As a result, Mr Agyarko also noted that there were enormous opportunities for companies to invest in gas piping systems that could link the entire country and further extend to the sub-region, particularly to the landlocked countries of Burkina Faso, Chad and Mali as part of efforts to make Ghana a major supplier of gas in West Africa. The minister said there were further opportunities for the investors to build oil refineries in the country to replace what he described as the obsolete facilities at the Tema Oil Refinery (TOR) which was built in the 1960s and refining below capacity. Mr Agyarko added that the government envisioned companies to build new facilities capable of refining between 150,000 barrels and 200,000 barrels of oil per day for supplies not only for the country but to countries, including Nigeria, an oil giant on the continent. He said there were opportunities for companies to fully own those facilities while there were also instances where the government would require partnerships in that area. According to him, the government was prepared to convert the facilities at TOR into a tank farm for the storage of refined petroleum products for internal use and for exports. The Energy Minister disclosed that the government had also prepared land in parts of the Western Region for investors willing to engage in this area to set up in a free zone enclave. He explained that companies that took advantage of the opportunity would enjoy enormous benefits, including tax breaks and would also be required to export their products. Mr Agyarko said even when the government intended to buy some of the products from such companies, those supplies would be treated as imports for the government and export for the investor at the prevailing international market price and in the currency used in that transaction. “This is meant to ensure that we do not interfere with the agreements and arrangements for setting up in that enclave,” he added. Meanwhile Ghana has for the first time opened a pavilion at the OTC which is celebrating its 50th anniversary this year. Made possible by Consolidated Shipping Agencies (Conship), more than 15 companies, including some government agencies, are participating in the event.